September 3, 2014 – On August 30, NASA’s twin Van Allen Probes celebrated their second year anniversary of studying the sun’s influence on the Earth and near-Earth space by studying the planet’s radiation belts. 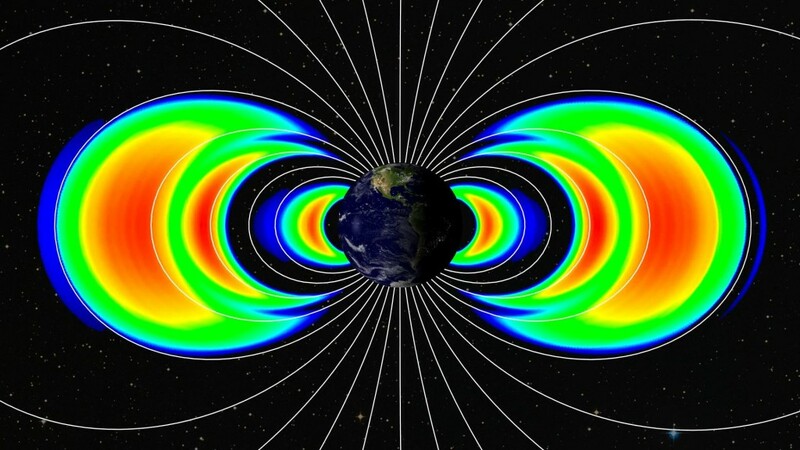 Understanding the radiation belt environment and its variability has extremely important practical applications in the areas of spacecraft operations, spacecraft system design, mission planning, and astronaut safety. The probes, each weighing just less than 1,500 pounds, were specifically designed to withstand and study the harsh radiation belt region around Earth. The belts are critical regions that have a connection to Earth’s atmosphere and space-based technologies. The belts are affected by solar storms and space weather events and as a result, can swell dramatically. When this occurs, they can pose dangers to communications and GPS satellites, as well as humans in low-Earth orbit. Soon after their launch in August 2012, the probes discovered a third radiation belt around Earth, where only two had previously been detected. The radiation belts are layers of energetic charged particles held in place by the magnetic field surrounding our planet. This revealed to scientists the dynamic and variable nature of the radiation belts and provided new insight into how they respond to solar activity. Formerly known as the Radiation Belt Storm Probes, the mission was renamed Van Allen Probes in November 2012 in honor of Dr. James Van Allen, who discovered the two radiation belts in 1958. Two characteristics of the Van Allen Probes make it stand out from all previous missions to study the radiation belts: First, by relying on two spacecraft instead of one, the Van Allen Probes can take simultaneous measurements at different locations and determine whether an event occurs at the same time throughout the belts or instead travels across the belts, changing over time and space. Second, the instrument suite is unusually comprehensive, able to measure an enormous range of energies, particles, and waves. The twin spacecraft have also revealed how particles in the heart of the belts can be accelerated to nearly the speed of light; proven that electrons in the belts are undergoing acceleration from very low frequency plasma waves; and shown persistent stripe-like structures are a common feature of the inner belt, and are caused by Earth’s rotation, a mechanism previously thought to be incapable of such an effect. The Van Allen Probes are the second mission in NASA’s Living With a Star (LWS) Program to explore aspects of the connected sun-Earth system that directly affect life and society. LWS is managed by the agency’s Goddard Space Flight Center in Greenbelt, Maryland. APL built the spacecraft and manages the mission for the agency’s Science Mission Directorate in Washington. The Laboratory for Atmospheric and Space Physics in Boulder provided significant contributions to the Van Allen Probes Electric Field and Waves Suite (EFW), which is designed to study the electric fields in near-Earth space that energize radiation particles and modify the structure of the inner magnetosphere.